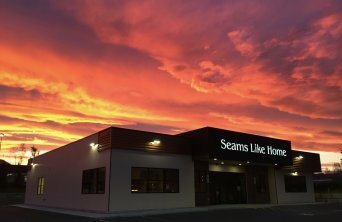 Seams Like Home is your one-stop fabric and quilting store. We carry over 10,000 bolts of fabric and the complete line of Bernina Sewing Machines. Come by today. Seams Like Home has been inspiring the creative community since 2002. We have been in a few locations throughout Anchorage from 76thAve to University Center to our final home here on 88thAve and Toloff. Each location gave us opportunities and experience that allowed us to become your quilting destination of choice. Do you know the Seams Like Home story? Maret had sewn and crafted all her life, but got serious about quilting in 1993 and dreamed of owning a quilt shop. In 2002, while still an elementary school teacher (retired in 2008), Maret made Seams Like Home a reality with the help and support of her family. In fact her amazing daughters now run the day to day operations of the shop. We've grown, changed and evolved into a very special shop with knowledgeable team members ready to help you with your next sewing project! We work hard to create a shop where it truly...Seams Like Home.